These Terms and Conditions of Use (the “Agreement”) constitute a legal agreement between you and Sindicato Cigars LLC (the “Company”) with respect to your access and use of the www.sindicatocigars.com website (the “Site”) owned by the Company. Your access and use of the Site are conditioned on your acceptance without modification of the terms and conditions contained in this Agreement. If you do not agree to all of the terms and conditions contained in this Agreement, you may not access and use the Site. Your access and use of the Site constitutes your acknowledgement that you have read, understand and agree to be bound by the Agreement. Please read the Agreement carefully and keep a copy of them for your reference. You consent to receive electronic communications and agree that all agreements, notices, disclosures and other communications that we provide to you electronically, via email or on or via the Site, satisfy any legal requirement that such communications be in writing. If you establish an account with us on or through this Site, you are responsible for maintaining the confidentiality of and restricting access to your account and password and you agree to accept responsibility for all activities that occur on or in connection with the Site under your account or password. You agree to immediately send notice to the Company if your password is compromised. You may not assign or otherwise transfer your account or any of your rights or obligations under this Agreement to, or share your account with, any other person or entity. You acknowledge that the Company is not responsible for third party access to your account resulting from your violation of this Agreement or theft or misappropriation of your account or password. The Company reserves the right to refuse or cancel service, terminate accounts or remove or edit content in its sole discretion. You acknowledge and agree that this Site and any domain names and uniform resource locators (urls) registered and/or used in connection with the Site are owned exclusively by the Company. You further acknowledge and agree that the works of authorship contained in this Site, including, but not limited to, all design, text, images and source code, are owned or licensed by the Company and may not be copied, reproduced, transmitted, displayed, performed, distributed, rented, sublicensed, altered, stored for subsequent use or otherwise used, in whole or in part, in any manner without the prior written consent of the Company. Sindicato, Hex and Casa Bella are trademarks of the Company. All other brands and logos on the Site are service/trademarks of their respective owners. The works of authorship and trademarks on the Site are protected by intellectual property and other laws. You agree not to modify, copy, create derivative works or otherwise appropriate or attempt to appropriate any intellectual property used on or in connection with the Site or to permit any other party to do any of the foregoing. You agree to observe and abide by all copyright, trademark and other proprietary notices, legends and other restrictions contained on the Site and to not delete or make any changes thereto. The Company reserves the right to update and make changes, additions or deletions (“Modifications”) to the Site at any time without notice to you. All rights, title and interests in any suchModifications made by or on behalf of the Company shall be owned by the Company. Subject to the terms and conditions of this Agreement, the Company hereby grants to you, a personal, non-exclusive, non-transferable and revocable limited license to access and use the Site. The limited license to access and use the Site granted herein only gives you the right to access and use the Site as set forth in this Agreement and does not give you any ownership interest in the Site or any intellectual property or content thereon. Except as expressly authorized by this Agreement, you are not granted any licenses, express or implied, to the Site or any intellectual property or content thereon. The Company may terminate this license at any time without notice to you. As a condition of your use of the Site, you warrant to the Company that you will not use the Site to enter or transmit any unlawful, fraudulent, harassing, libelous or obscene information of any kind or any information in violation of another party’s intellectual property rights or for any other purpose that is unlawful or prohibited by this Agreement. You may not use the Site in any manner which could damage, disable, overburden, or impair the Site or interfere with any other party’s use and enjoyment of the Site. You may not obtain or attempt to obtain any materials or information through any means not intentionally made available or provided for through the Site. You hereby agree to comply with the requirements of the Communications Decency Act, the Digital Millennium Copyright Act and all other laws applicable to your activity on the Site. You agree to indemnify the Company against any and all losses or damages suffered by the Company as a result of any such unlawful or prohibited use. You acknowledge and agree that the Company may, in its sole discretion, at any time and without prior notice, restrict your access to the Site or any portion of the Site. You further acknowledge and agree that the Company will comply with all subpoenas and court orders that appear to be lawful and valid, including subpoenas and court orders requesting information about you or your use of the Site, without prior notice to you. The Company reserves the right to report activity that it believes to be potentially criminal to the appropriate law enforcement agencies. The Site may contain links to other websites (the “Linked Sites”). The Linked Sites are not under the control of the Company and the Company is not responsible for the content on any Linked Site or any other website linked from a Linked Site. The Company is providing these links to you only as a convenience and the inclusion of any link does not imply endorsement by the Company of the Linked Site, its operators or the products or services offered by such operators. Certain services made available via the Site are delivered by third party websites and organizations. By using any product, service or functionality originating from the Site, you hereby consent to the Company sharing information and data with any third party with whom the Company has a contractual relationship to provide the requested product, service or functionality on behalf of users and customers of the Site. Your access and use of the Site may involve applications and services that were not developed or are not operated by the Company and that are not under the control of the Company, including, but not limited to, your mobile phone’s or computer’s operating system, browser, email and SMS programs, dialer and other applications and services. The Company cannot assure you that these third party applications and services will function and expressly denies any liability related to such third party applications and services. In addition, depending on your data plan, you may incur charges from your provider for use of their network in connection with the Site. You are solely responsible for any and all costs you incur with your internet and/or wireless service provider and any other third parties as a result of your usage of the Site. You agree to indemnify, defend and hold harmless the Company, its affiliates and their respective members, managers, officers, directors, employees, agents and third parties, for any losses, costs, liabilities and expenses (including reasonable attorneys’ fees) relating to or arising out of your use of the Site or your violation of this Agreement, any rights of a third party or any applicable laws, rules or regulations. The Company reserves the right, at its own cost, to assume the exclusive defense and control of any matter otherwise subject to indemnification by you, in which event you will fully cooperate with the Company in asserting any available defenses. THE INFORMATION, SOFTWARE, PRODUCTS, AND SERVICES INCLUDED IN OR AVAILABLE THROUGH THE SITE MAY INCLUDE INACCURACIES OR TYPOGRAPHICAL ERRORS. CHANGES ARE PERIODICALLY ADDED TO THE INFORMATION HEREIN. THE COMPANY MAY MAKE IMPROVEMENTS AND/OR CHANGES IN THE SITE AT ANY TIME. THE COMPANY MAKES NO REPRESENTATIONS ABOUT THE SUITABILITY, RELIABILITY, AVAILABILITY, TIMELINESS, AND ACCURACY OF THE INFORMATION, SOFTWARE, PRODUCTS, SERVICES AND RELATED GRAPHICS CONTAINED ON THE SITE FOR ANY PURPOSE. TO THE MAXIMUM EXTENT PERMITTED BY APPLICABLE LAW, ALL SUCH INFORMATION, SOFTWARE, PRODUCTS, SERVICES AND RELATED GRAPHICS ARE PROVIDED “AS IS” WITH ALL FAULTS AND WITHOUT ANY WARRANTY OR CONDITION OF ANY KIND, EXPRESS, STATUTORY OR IMPLIED. THE COMPANY HEREBY DISCLAIMS ALL WARRANTIES AND CONDITIONS WITH REGARD TO THE INFORMATION, SOFTWARE, PRODUCTS, SERVICES AND RELATED GRAPHICS, EXPRESS OR IMPLIED, INCLUDING, BUT NOT LIMITED TO, WARRANTIES OR CONDITIONS OF MERCHANTABILITY, FITNESS FOR A PARTICULAR PURPOSE, TITLE, NON-INFRINGEMENT, CONDITION, UNITERRUPTED USE, MERCHANTABILITY OF COMPUTER PROGRAMS AND DATA ACCURACY, EXCEPT TO THE EXTENT THAT ANY WARRANTIES IMPLIED BY LAW CANNOT BE VALIDLY WAIVED. THE COMPANY DOES NOT WARRANT OR MAKE ANY REPRESENTATIONS REGARDING THE OPERATION OF THE SITE, THE USE, VALIDITY, ACCURACY OR RELIABILITY OF, OR THE RESULTS OF THE USE OF THE SITE CONTENT, AND THE COMPANY MAKES NO COMMITMENT TO UPDATE THE SITE OR CONTENT. YOU ACKNOWLEDGE THAT THE COMPANY DOES NOT OPERATE OR CONTROL THE INTERNET. THE COMPANY DOES NOT WARRANT THAT ANY CONTENT AVAILABLE FOR ACCESS OR DOWNLOADING FROM THE SITE, IF ANY, WILL BE FREE FROM INFECTION, VIRUSES, WORMS, TROJAN HORSES OR OTHER CODE THAT MANIFEST CONTAMINATING OR DESTRUCTIVE PROPERTIES. THE COMPANY DOES NOT WARRANT THAT THE SITE WILL OPERATE UNINTERRUPTED OR ERROR-FREE, THAT ACCESS TO THE SITE WILL BE UNINTERRUPTED OR ERROR-FREE OR THAT ANY DEFECTS IN THE SITE WILL BE CORRECTED. TO THE MAXIMUM EXTENT PERMITTED BY APPLICABLE LAW, IN NO EVENT SHALL THE COMPANY BE LIABLE FOR ANY DIRECT, INDIRECT, PUNITIVE, INCIDENTAL, SPECIAL, CONSEQUENTIAL DAMAGES OR ANY DAMAGES WHATSOEVER, INCLUDING, WITHOUT LIMITATION, DAMAGES FOR LOSS OF USE, DATA OR PROFITS, ARISING OUT OF OR IN ANY WAY CONNECTED WITH THE USE OR PERFORMANCE OF THE SITE, WITH THE DELAY OR INABILITY TO USE THE SITE OR RELATED SERVICES, WITH THE PROVISION OF OR FAILURE TO PROVIDE SERVICES, OR FOR ANY INFORMATION, SOFTWARE, PRODUCTS, SERVICES AND RELATED GRAPHICS OBTAINED THROUGH THE SITE, OR OTHERWISE ARISING OUT OF THE USE OF THE SITE, WHETHER BASED ON CONTRACT, TORT, NEGLIGENCE, STRICT LIABILITY OR OTHERWISE, EVEN IF THE COMPANY HAS BEEN ADVISED OF THE POSSIBILITY OF DAMAGES. BECAUSE SOME STATES/JURISDICTIONS DO NOT ALLOW THE EXCLUSION OR LIMITATION OF LIABILITY FOR CONSEQUENTIAL OR INCIDENTAL DAMAGES, THE ABOVE LIMITATION MAY NOT APPLY TO YOU. IF YOU ARE DISSATISFIED WITH ANY PORTION OF THE SITE, OR WITH THIS AGREEMENT, YOUR SOLE AND EXCLUSIVE REMEDY IS TO DISCONTINUE USING THE SITE. IN NO EVENT SHALL THE COMPANY BE LIABLE TO YOU FOR ANY AMOUNT AS A RESULT OF YOUR ACCESS AND USE OF THE SITE. The Company has no responsibility for any information entered into the Site by or on behalf of you or by any user of the Site and you agree to indemnify the Company against any and all losses or damages suffered by the Company relating to information entered into the Site by or on behalf of you or users of the Site. You hereby grant to the Company the right to use the information entered in the Site to the extent necessary to perform its obligations hereunder. You acknowledge and agree that the Site may not be available on a continuous or uninterrupted basis and that the Site may be inaccessible or inoperable for any reason, including, but not limited to, periodic maintenance or repairs, equipment malfunctions and causes beyond the control of the Company or that could not be reasonably be foreseen by the Company, including, but not limited to, internet or wireless service interruption or failure. The Company does not guarantee the integrity of information transmitted via the Site and shall not be liable for the inadvertent disclosure of, or corruption or erasure of, information transmitted or received or sorted on the Company’s system. The Company shall not be liable to you for any claims or damages which may be suffered by you, resulting from the loss of information, inability of you or any other person to access or use the Site or inability to transmit or receive information caused by or resulting from any delays, non-deliveries or mis-deliveries of information or service interruptions, whether or not caused by the fault or negligence of the Company. You acknowledge and agree that the Site is not intended to replace traditional means of communication and that it is your responsibility to use traditional means of communications when necessary to ensure that your communications are received. You acknowledge and agree that the Internet is a network of computers worldwide and that any information submitted by you through the Site is routed via third party computers, and that the Company is not responsible for lapses in online security and does not assume liability for improper use of the your information by a third party. You agree that neither the Company nor its managers, members, officers, directors, employees, agents, partners and licensors will be responsible for your use, misuse or reliance on the Site, the unavailability or mis-operation of the Site or for any actions by any users of the Site or any other person, whether in connection with the Site or otherwise. This limitation of liability shall apply to prevent recovery of any actual, direct, consequential, incidental, punitive or other indirect damages, regardless of the size or origin, or whether the damages arise from use, misuse, or reliance on the Site, or from any unavailability or mis-operation of the Site for any cause or reason. The provisions of the Agreement allocate the risks between the Company and you. It is expressly understood and agreed that each and every provision of this Agreement which provides for a limitation of liability, disclaimer of warranties or exclusion of damages is intended by the parties to be severable and independent of any other provision and to be enforced as such. The Company reserves the right, in its sole discretion, to restrict or terminate your access to the Site or any potion thereof at any time, without notice. Upon termination, for any reason, all rights granted to you hereunder will terminate and revert to the Company and you shall immediately cease any and all use of the Site. Termination of your access shall not relieve you of any liability for your breach of any provision of this Agreement prior to or after the termination. Notwithstanding any termination of your access, the Company shall have and hereby reserves all rights and remedies, which it has or which are granted to it by operation of law, to enjoin the unlawful or unauthorized use of the Site or any Company intellectual property or proprietary information. The provisions in this Agreement regarding limits on liability, intellectual property, indemnification, governing law, jurisdiction, venue and your other responsibilities shall survive the termination of your access and this Agreement and shall remain in effect indefinitely. To the maximum extent permitted by law, this Agreement is governed by the laws of the State of Florida and you hereby consent to the exclusive jurisdiction and venue of courts in Palm Beach County, Florida in all disputes arising out of or relating to the use of the Site. Use of the Site is unauthorized in any jurisdiction that does not give effect to all provisions of this Agreement, including, without limitation, this section. The parties each irrevocably and unconditionally waive any right to a jury trial with respect to any claims or disputes arising out of or related to this Agreement. You acknowledge and agree that any breach or threatened breach by you of any of the covenants and restrictions related to usage of the Site, intellectual property, proprietary information, termination and your other responsibilities contained in this Agreement will give rise to irreparable injury which may not be adequately compensated by damages and, therefore, you agree that in the event of any such breach or threatened breach, the Company may seek and shall be entitled to injunctive relief, without the posting of bond, and to the enforcement of these covenants and restrictions by specific performance, in addition to any other rights and remedies available hereunder or under applicable law. You agree that no joint venture, partnership, employment, or agency relationship exists between you and the Company as a result of this Agreement or use of the Site. The Company’s performance of this Agreement is subject to existing laws and legal process, and nothing contained in this Agreement is in derogation of the Company’s right to comply with governmental, court and law enforcement requests or requirements relating to your use of the Site or information provided to or gathered by the Company with respect to such use. If any part of this Agreement is determined to be invalid or unenforceable pursuant to applicable law including, but not limited to, the warranty disclaimers and liability limitations set forth above, then the invalid or unenforceable provision will be deemed superseded by a valid, enforceable provision that most closely matches the intent of the original provision and the remainder of the Agreement shall continue in effect. Any waiver of any provision of this Agreement shall be valid and effective only in the specific instance and for the specific purpose for which it is given and shall not be deemed continuing or construed as a waiver of any other provision of this Agreement. Unless otherwise specified herein, this Agreement constitutes the entire agreement between the user and the Company with respect to the Site and it supersedes all prior or contemporaneous communications and proposals, whether electronic, oral or written, between the user and the Company with respect to the Site. A printed version of this Agreement and of any notice given in electronic form shall be admissible in judicial or administrative proceedings based upon or relating to this Agreement to the same extent and subject to the same conditions as other business documents and records originally generated and maintained in printed form. It is the express wish to the parties that this Agreement and all related documents be written in English. The Company reserves the right, in its sole discretion, to revise this Agreement without notice to you. The most current version of the Agreement will supersede all previous versions. By continuing to use the Site, you agree to be bound by any such revisions. The Company encourages you to periodically review the Agreement to stay informed of our updates. Welcome to Sindicato Cigars. Verify your age. You must be 21 years or older to enter. 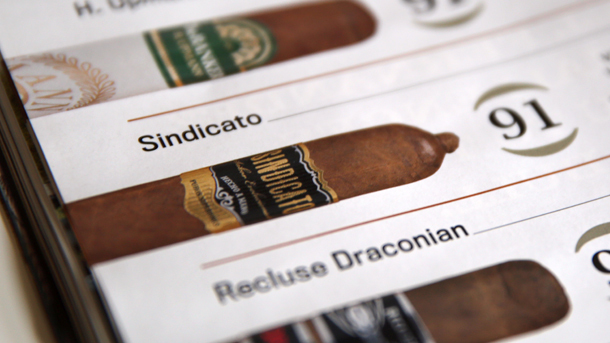 We’re pleased to announce that Cigar Snob Magazine has rated the Sindicato Toro a 91! ©2016 Sindicato Cigar Group, LLC. All rights reserved.